This speaker was designed for the Beolab 5000 system and was itself a development of the style first seen in the Type K loudspeaker. However, the Beolab 5000 amplifier produced considerably more power than this earlier speaker could handle. Beovox 5000 went through three incarnations during its six year life. 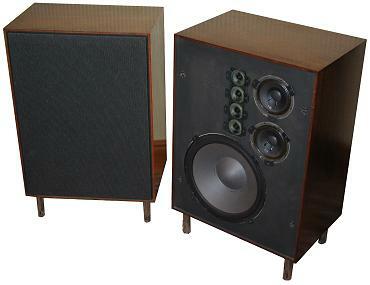 The first of these was a seven unit speaker with a large 12” bass unit, two round midrange units and a vertically stacked array of four 2” tweeters. In addition, a connection was provided for the famous Beovox 2500 cube tweeter. This recognised the fact that the small cone tweeters were by their very nature extremely directional, so Beovox 2500 was designed to allow a broader sound stage. Plugging in the 2500 disconnected the tweeters in the 5000. Text copyright © Beocentral. Unauthorised reproduction prohibited. There were two potentiometers mounted on the rear of the cabinet next to the plug for the tweeter which allowed manipulation of the frequency response for midrange and treble. Position 3 allowed an extremely flat response between 50Hz and 20,000Hz. The crossover was accessed by removing the bass driver which was held in place by four external brackets. Text copyright © Beocentral. Unauthorised reproduction prohibited. A fairly solid perforated metal front panel was fitted with a cloth cover. Some idea may be given of the quality of the finish of the cabinet, available in rosewood, teak or oak, by the fact that the B&O badge was gold plated! The cabinet was supported by four short legs. The finish of the first incarnation of Beovox 5000 seemed to be the best of the three. Text copyright © Beocentral. Unauthorised reproduction prohibited.